“Designed and arranged in partnership with Aalto EE, Leaders’ Next Move program provided managers at Finnair with lessons and tools for shifting from a reorganization mode to a path of growth”, states Eija Hakakari, Finnair’s Senior Vice-President for human resources. 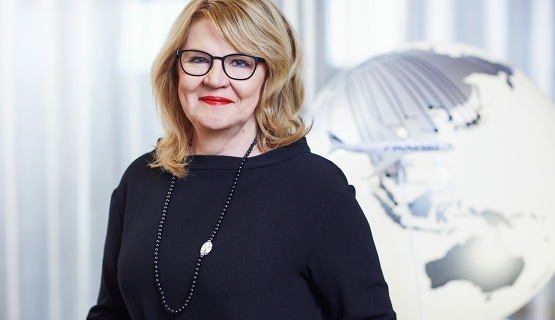 Eija Hakakari, Finnair’s Senior Vice President (People & Culture), has collaborated with Aalto EE’s Senior Advisor Ben Nothnagel also in the past. As Finnair began to shift from reorganization to a period of growth, Hakakari felt that Nothnagel would be the right person to envisage what type of training and thinking Finnair’s executives needed. Hakakari and her team member Anu Henttonen designed and delivered the Next Move program together with Ben Nothnagel, Group Managing Director Dr. Pekka Mattila, and Senior Executive Raija Kuokkanen from Aalto EE. Change isn’t only connected to economy, but there’s been a cultural shift at play." A total of 80 Finnair key managers took part in the program. The program ran for a duration of nine months, which has followed for instance with personal coaching and implementing lessons into practice in the organization. The burning question in the program’s design was the way Finnair was preparing for growth: What steps would make the organization growth-oriented? “The program has impact due to Nothnagel’s method and thinking that focus on people and personal growth of leaders. This gives tools for putting one’s personality into use in leadership”, explains Eija Hakakari. The shift offered a good opportunity for training and reflecting on personal leadership." Ben Nothnagel mentions that as the leadership context changes, leaders themselves don’t need to change, but they do need to think about what to focus on: What is the next move for creating a better foundation for growth? As homework, Nothnagel gets managers to test and observe their conscious decision-making in practice. He links change to an easily recognizable daily context in a way that works and results in new behavior and conscious decisions. Leaders need to also be able discuss their personal weak spots. “We’re not talking about something fluffy here, but it’s about growing as individuals and human beings”, says Hakakari. She praises Nothnagel’s way of raising sensitive issues in a safe atmosphere. Ben Nothnagel talks about his methods and gives food for thought for leaders in Aalto Leaders' Insight podcast. In this case, Mattila and Nothnagel operated parallelly: Nothnagel focused on personal leadership, while Mattila highlighted the importance of organizational culture and a management framework. “Nothing is more inspiring than being able to contribute to a great turnaround case where profound changes are needed both quantitatively and qualitatively”, says Mattila. Raija Kuokkanen from Aalto EE has years of experience in working with customized programs. Experts are always picked for the program according to the needs and situation of the customer. “No one could reach the same results alone”, says Kuokkanen. In Finnair’s case, the program followed a script of Pekka Mattila first discussing the role of leadership culture in strategy implementation: How to create winning culture, and the required leadership mindset for building growth. Participants then explored what this demanded from each manager individually and their next move. With over 40 years’ experience, Aalto EE develops world-class solutions for its customers. Read more about Aalto EE's customized solutions. Currently reading: Aalto Leaders' Insight: Case Finnair: What’s your next move in growing as a leader?